All Invitations Just $1 or Less! celebration to a next level. Announce Your Big Day in High Style!! Choose the card of your choice and order your sample. For sample order, there would be no shipping charges. You only need to pay actual card cost as a sample cost. The selected sample will reach your doorstep within 3 to 5 working days. After you receive your sample, check them physically and get the feel, how your actual wedding card will look alike? If you would like to see more samples then add more samples at the point of sample ordering. Sample customization is also available. If satisfied with the sample quality, now, it’s time to place the final bulk order for your wedding cards. You can make your order online, or you can send us your requirements on our email id info@123weddingcards.com Attach your wording document at the time of online ordering or just email your final wedding invitation wording. We will create digital proofs on the basis of the details we received. We will send back to you for final approval. Check the digital proof of your wedding cards and let us know if there are any changes you would like to make then send us back for the final printing. The well packed printed cards will be delivered at your doorstep in estimated time declared by us. We cater what we show so feel relax about the quality of your wedding cards. Sample order amount fully adjustable on bulk orders. Create an invitation of your dreams. Customize Now! I really loved the scroll wedding invitations I received my wedding invites 5 day after ordering. Everyone praised our wedding invites, the best part of invitation was its design, pattern and printing. You guys did an absolutely stunning job The quality is very impressive Thank you. Great designs, Superb quality. Thanks 123WeddingCards for your services. I ordered the foil stamped invitations and those were some of the finest invites i have ever seen, they felt so good on touching printing was very fine with absolute eye pleasing color blends. Superb guys feeling awesome after getting my wedding cards. great paper quality. Selecting a card for your wedding is one of the difficult tasks for a bride as well as the groom. So, 123WeddingCards is here to help you with a wide range of Indian wedding invitations with memorizing patterns, motifs, and designs. Our limitless wedding invites are unique, affordable and perfect for your special occasion. With a limitless collection of Indian Wedding Cards, we are providing cards printing services all over the globe since 15 years. 123WeddingCards is an online wedding invitations and wedding stationery store since 2003, which has left no stone to the upturn in making your day a big one. With all the zeal and enthusiasm embed; we bring the many reasons to choose us for your wedding invitation cards. With provides the numerous printing styles of silkscreen printing, UV printing, embossing and foil embossing, offset printing and digital printing and many more. Along with unique Indian style wedding cards, we also provide invitation add-ons, reception essential, wedding favors & other wedding stationery with fully customization options. 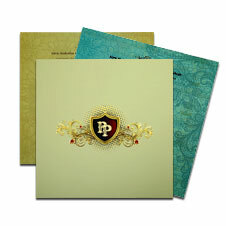 123WeddingCards provide fully customization of the online wedding cards and stationery from the scratch. You can choose the paper quality, ink, font style, invitation wordings, number of inserts of the cards and multiple printing styles allow you to customize your invites. We ship our products across the globe in most of the countries of Asia, Europe, India, Africa, Australia, North America and South America. From more than 5000 wedding fonts, you can pick any font from the collection and make your card completely personalized. If you wish to feel the quality and texture of the invites, just pick any free sample from our list and get it matched with your style and color. 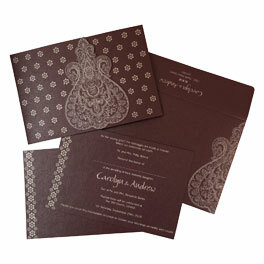 We also have a huge collection of Indian themed wedding cards. Floral cards, laser cut invites, peacock theme cards, foil stamped invites and these are highly demanded and look absolutely lovely for an important day of your life. Also, the wedding themes have become a new trend, with the unique designs of invitations like paisley invites, butterfly cards, damask invites and simple theme invitations. We can assure you to provide a wedding invitation which your guests have never seen before. 123WeddingCards will definitely fulfill your needs by providing the best Indian wedding invitations and wedding cards india at the best price. Rich, vibrant & the largest collection of wedding invitations. Get styled your wedding with royal scroll invitations. Pick up the designer invitations & Push your celebration to a next level.